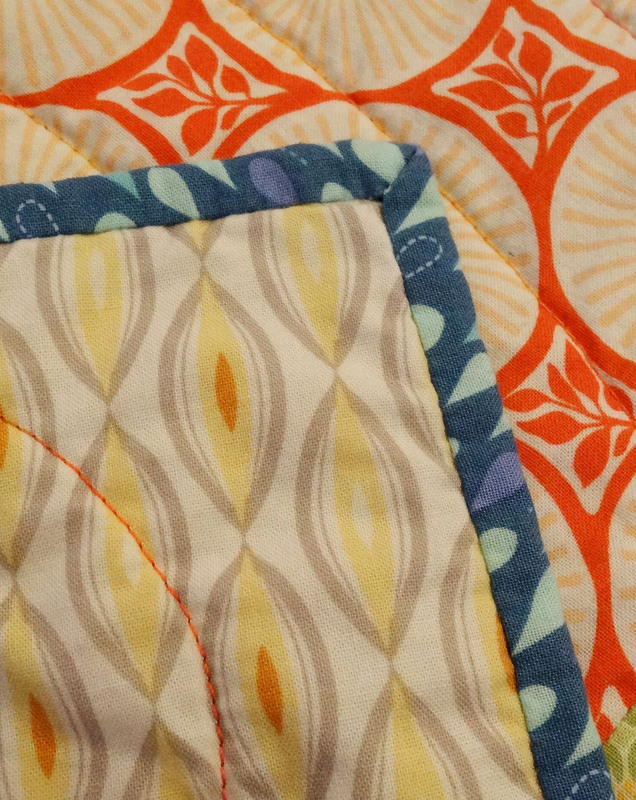 I finished my first quilt of 2014. It was made for the newborn son of one of my friends. She’s the first of my high school and university friends to have a baby so it was a very special occasion. 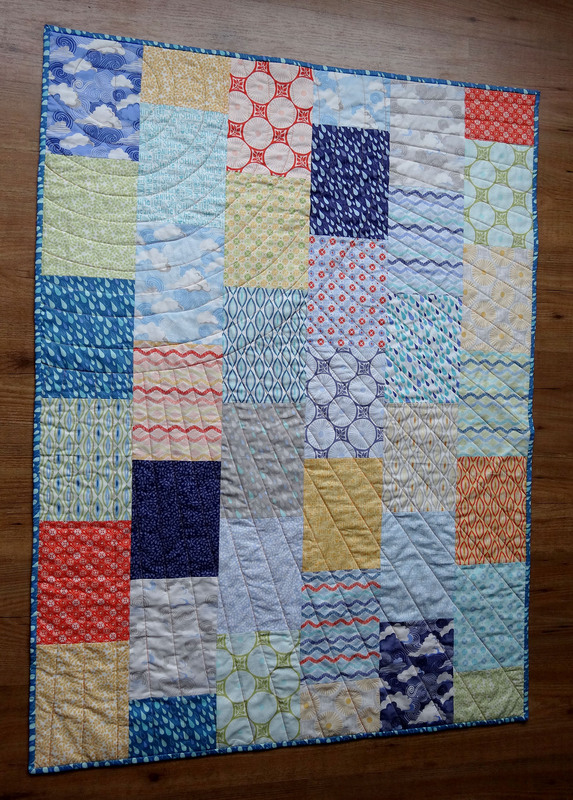 The finished quilt measures 35’’ x 47 ¼’’ (90 x 120 cm). I wanted this to be a relatively quick make and didn’t want to do any seam matching while piecing. For the front I cut 6.5’’ x 8.5’’ rectangles that were assembled in alternating columns of 5 or 6 pieces. The top and bottom of the columns with 5 pieces were filled up with 6.5’’ x 4.5’’ rectangles. I didn’t use all of the fabrics in the collection. There are a couple that are a bit on the floral side that I think are too girly for a boy’s quilt. I tried to include the two blue fabrics on the bottom row in the picture but on their own they looked out of place so I decided to duplicate some of the other fabrics instead. At first I wasn’t sure what to do with the back. 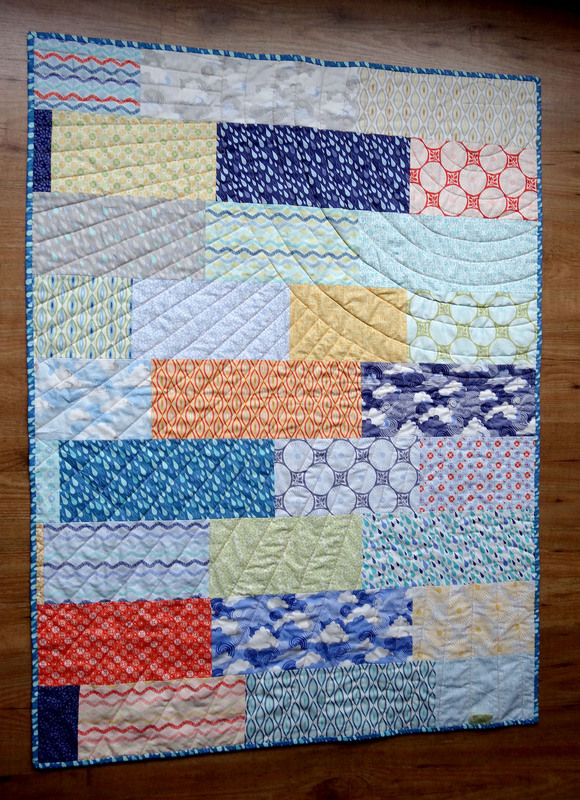 I considered using a solid with some blocks of the Sunnyside collection pieced in. 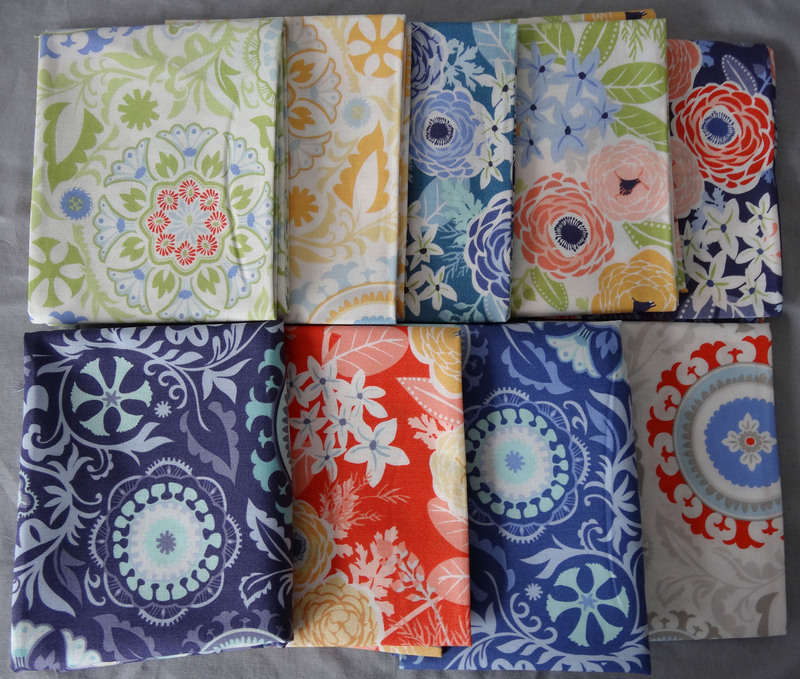 The problem with this idea was that I didn’t have enough of a solid fabric in my stash that really works with this collection and there are no quilt shops in Leiden so buying something new would either mean going to another city or buy online. The risk of the latter being that the colour I pick might not work with the collection after all when I get it. Since I had a lot of fabric left over from making the top I simply cut 6’’ strips of varying length and assembled these in rows. For the quilting I wanted to stay in theme with the fabric and did a huge sun with sunrays in an orange variegated thread using my walking foot. The rays turned out pretty straight but the sun is a bit wobbly/wonky in some of the circles. I probably wanted to go too fast. In the centre of the sun I quilted the boy’s initial, I like this detail. For the binding I had the same issue of not knowing which solid would work well. 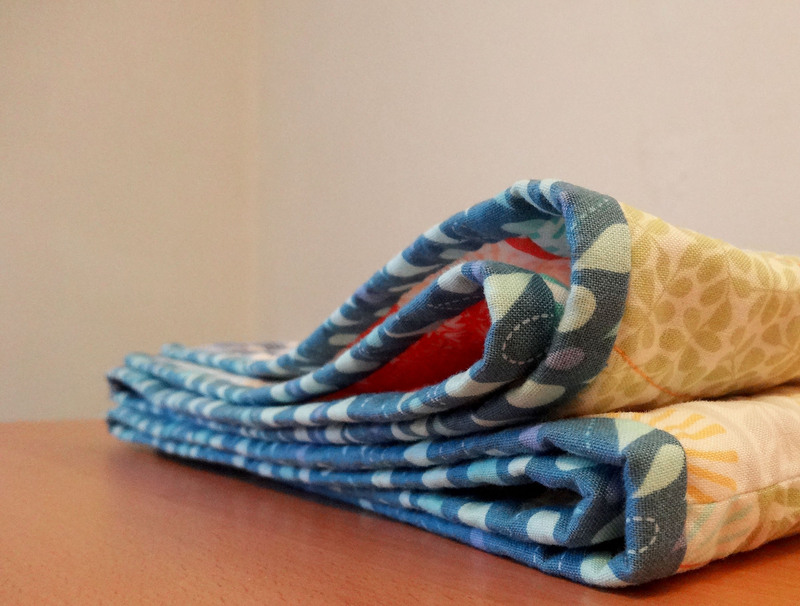 I realised that the fabrics that I could be certain would work were the ones that were already in the quilt. I searched Dutch online fabric stores and could find only 1 fabric from this collection for sale in the whole of the Netherlands and that’s the one I ended up using. The binding was handsewn to the quilt and I think this process took longer than the piecing of the front and back of the quilt. I love the look of a handsewn binding so I suppose it’s worth the time and effort. 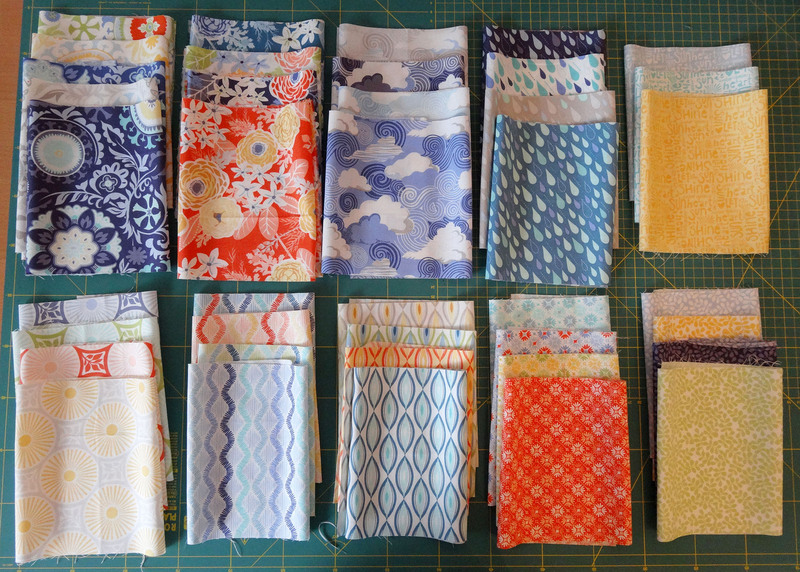 Unsurprisingly, I still have quite a bit of fabric left over from my fat quarter bundle so I thought it would be fun to share some of it with one of my lovely readers. I cut pieces that measure at least 6’’x12’’ of each fabric from the collection. Most are more generous. This is enough fabric to create a decent sized quilt top. I leave it up to the winner to cut it up into squares, rectangles, triangles, hexagons or whatever else takes their fancy. To enter leave a comment that clearly states that you wish to enter the giveaway. If you just comment “hey, I like your quilt” I will assume you are not interested in the fabric. You can enter until Wednesday March 5th, 20.00h UTC +1. Friends and family are allowed to enter. Prize drawing will be performed by my boyfriend.